Elderly Exploitation Happens More Than You Think. Has Your Loved One Been a Victim? Unfortunately, elderly people make good targets for exploitation, and sadly, it happens more often than you might think. Until recent years, there was very little that could be done to stop the exploitation if someone suspected that their vulnerable family member was being taken advantage of financially. This created a big problem for both the victim and their families. Thankfully, changes have been made to at least slow down the problem. Florida Statute 825.1035 creates an injunction for the protection of elderly or vulnerable adults against exploitation. This means that if you suspect an elderly member of your family is being financially exploited, you can get an injunction to stop it. Who Can Be Protected by an Injunction? In order for an injunction to be considered, the individual must be 18 years of age or older and be unable to perform normal daily activities on their own due to their impairment. The impairment may be due to an injury, disability, or aging. The statute was created to protect not just the elderly, but those who are easy targets for exploitation due to any type of impairment. Exploitation of an elderly individual may occur by another individual who is in a business relationship or trusted by the elderly adult, has access and uses the elderly person’s property or funds with the intent of depriving the elderly person the benefit or use of the property or funds. Exploitation happens when someone should have known, or knew, the elderly person lacked the capacity to consent. 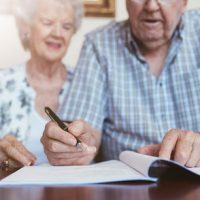 Exploitation occurs when a trustee, guardian, or power of attorney (also known as a fiduciary) transfers or sells an elderly person’s property or assets without their authorization. Exploitation may occur when an elderly person holds a joint account with themselves and another individual. For example, if an elderly person has a trusted neighbor listed on their checking account so that trusted neighbor can help pay the elderly person’s bills each month. Instead of paying just the elderly person’s bills, however, the trusted neighbor also uses funds out of the joint account for themselves. This is considered exploitation of an elderly adult. Exploitation occurs when a person or caregiver that the elderly adult trusts fails to use the elderly person’s assets or income to provide the elderly person with the necessary care and support that they need. If these elements have been met, an injunction of 15 days may be ordered without having to give any notice to the proposed exploiter. If you believe an elderly loved one is being exploited, it is imperative that you contact an attorney as soon as possible. They will be able to help you determine if an injunction is an appropriate action for your situation. They can also help you establish a guardianship and estate plan to prevent further exploitation from happening. Tampa attorney David Toback has decades of experience handling estate plans and guardianships and can advise you what steps to take if you feel like your loved one is being inappropriately taken advantage of. Contact him today to schedule a consultation.